One current threat causing a lot of sleepless nights to victims is "Cryptolocker" like malware. Various variations of this type of malware are still haunting small businesses and home users by encrypting files and asking for ransom to obtain the decryption key. Your best defense against this type of malware is a good backup. Shadow volume copies may help, but aren't always available and complete. In particular for small businesses, various simple NAS systems have become popular over the recent years. Different manufacturers offer a set of Linux based devices that are essentially "plug and play" and offer high performance RAID protected storage that is easily shared on the network. One of these vendors, Synology, has recently been somewhat in the cross hairs of many attacks we have seen. In particular vulnerabilities int he web based admin interface of the device have led to numerous exploits we have discussed before. The most recent manifestation of this is "Synolocker", malware that infects Synology disk storage devices and encrypts all files, similar to the original cryptolocker. Submissions to the Synology support forum describe some of the results . The malware will also replace the admin console index web page with a ransom message, notifying the user of the exploit. It appears however that this is done before the encryption finishes. Some users where lucky to notice the message in time and were able to save some files from encryption. It appears that the best way to deal with this malware if found is to immediatly shut down the system and remove all drives. Then reinstall the latest firmware (may require a sacrificial drive to be inserted into the system) before re-inserting the partially encrypted drives. keep offline backups. this could be accomplished with a second disk station that is only turned on to receive the backups. Maybe best to have two disk stations from different manufacturers. It is important to note that while Synology has been hit the hardest with these exploits, other devices from other manufacturers had vulnerabilities as well and the same security advice applies (but typically, they listen on ports other then 5000). Needless to say, I got intrigued, and luckily the sender of the tweet was willing to share a sample. The sample turned out to be simple legal threat malware e-mail written in German. The e-mail claimed that the recipient downloaded a copyrighted movie and it asked for legal fees. The invoice for the legal fees was supposed to be included in the attached ".cab" file. Am 01.08.2014 wurde von Ihrem Rechner mit der IP-Addresse 192.0.2.1 um 12:13:01 der Film "Need for Speed" geladen. Nach §19a UrhG ist dies eine kriminelle Handlung. Unsere Anwaltskanzlei muss dies ans zuständige Amtsgericht melden, au�?er Sie Zahlen ein au�?ergerichtliches Strafgeld in Höhe von 436.43 Euro an uns. Die Rechnung "1234.cab" entnehmen Sie dem Anhang. The attached .cab file runs a typical trojan downloader that could download various pieces of malware. 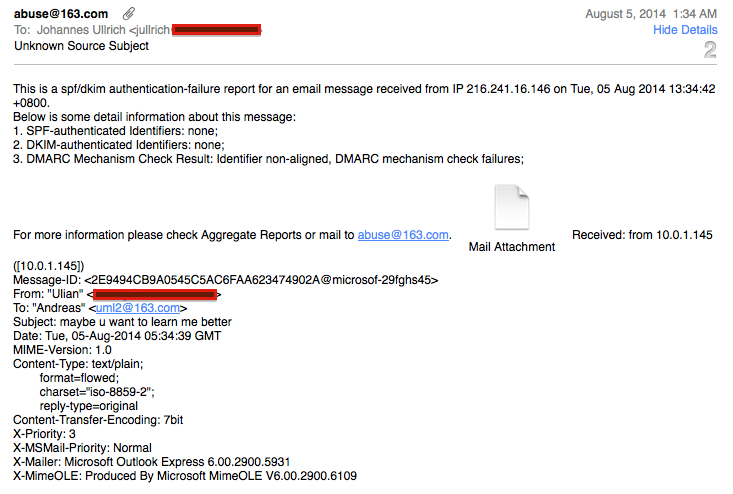 A quick search shows a number of other reports of this email, with different "From:" names. It looks like it picks plausible German names, maybe from the contact list of infected systems. My names isn't that terrible unusual, so I don't think this is targeted at all. Sometimes it is just an odd coincidence, and they aren't really after you. The attachment does include a report with details why the e-mail was found to be suspect (of course, you should still be careful with attachments. These reports can be faked too!) ;-).